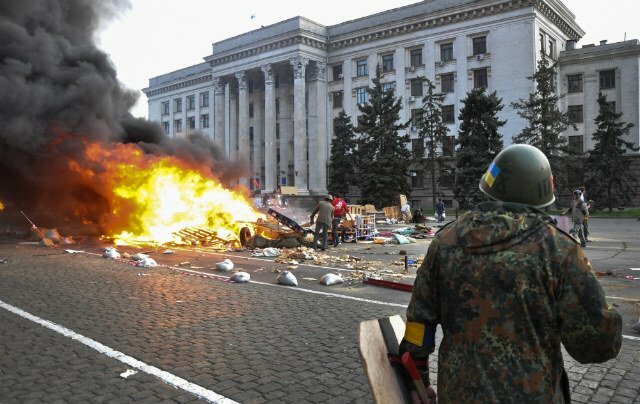 Ukraine’s interim PM Arseniy Yatsenyuk has blamed the country’s security services for failing to stop violence in the southern city of Odessa that left more than 40 people dead. Most of the victims were pro-Russian separatists who died in a fire after barricading themselves in a building. Arseniy Yatsenyuk’s comments came as Ukrainian troops surrounded the pro-Russian stronghold of Sloviansk in the east. He said the police chief of the Odessa region had been removed and that the prosecutor’s office had started an investigation. However, Arsniy Yatsenyuk also blamed pro-Russian groups for “provoking the unrest”. He accused Russia and pro-Russian protesters of orchestrating “real war… to eliminate Ukraine and eliminate Ukrainian independence”. Ukrainian troops have encircled Sloviansk as the government seeks to wrest control from the separatists. Several people were reported killed in clashes around Sloviansk on Saturday. The defense ministry said one checkpoint was removed overnight. Gunfire was also reported overnight in Kostyantynivka and Mariupol as Ukrainian forces tried to reclaim government offices. There was heavy fighting in the town of Kramatorsk on Saturday, with the interior ministry saying the army had retaken a television tower. Kiev officials said at least two people were killed in the town, although Russian state television reported 10 deaths.